What could be better than a good cup of coffee in the morning? A good cup of coffee and ringside seats to an epic battle between man and lizard, that’s what. This Star Trek Arena Mug gives you the best of both worlds. 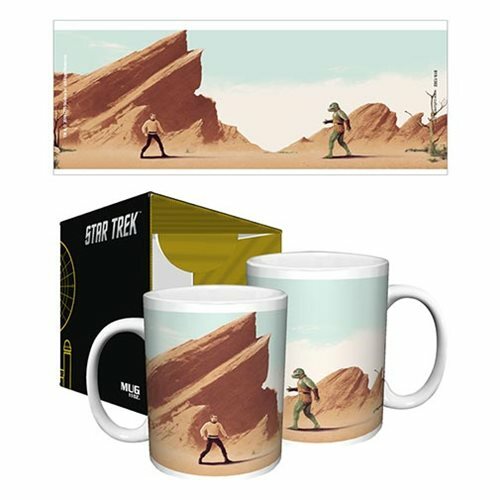 A cup of joe and a mug that depicts the epic battle between Captain Kirk and a Gorn. This mug is a must have for Star Trek fans. Relive the epic Arena episode from season one all over again while you get caffeinated. Everyone in the office will be jealous of this amazing drinking vessel and some may even try to fight you in order to get it for themselves.